I visited Meet and Treat in Newcastle when it very first opened. Simon and I dashed in for a quick coffee at the beginning of a very busy Saturday and immediately loved the feel of the place. We decided to head back for a proper look as soon as we could, but days turned into weeks, weeks turned into months and soon we'd more or less forgotten about this cosy little place on the edge of China Town. Then suddenly, Meet and Treat were everywhere! Fresh from a menu relaunch I saw images of the most beautiful looking food pop up all over my social media and, just like that, Meet and Treat were back on my radar and I was desperate to visit. If you've not heard of Meet and Treat then you need to listen up because you are seriously missing out. 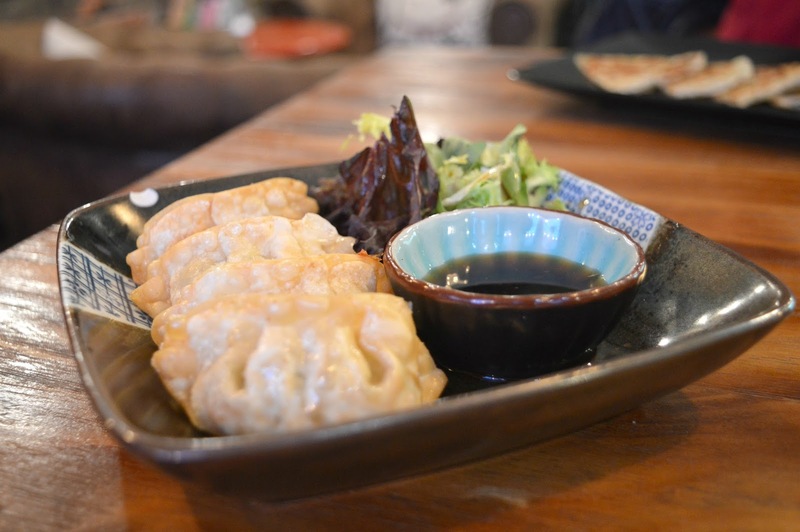 The cosiest little cafe at the edge of Newcastle's China Town, they take inspiration from the quirky coffee houses of Penang and offer a snug little hideaway where you can lose hours of the day enjoying the most amazing pan-Asian food and sweet treats. 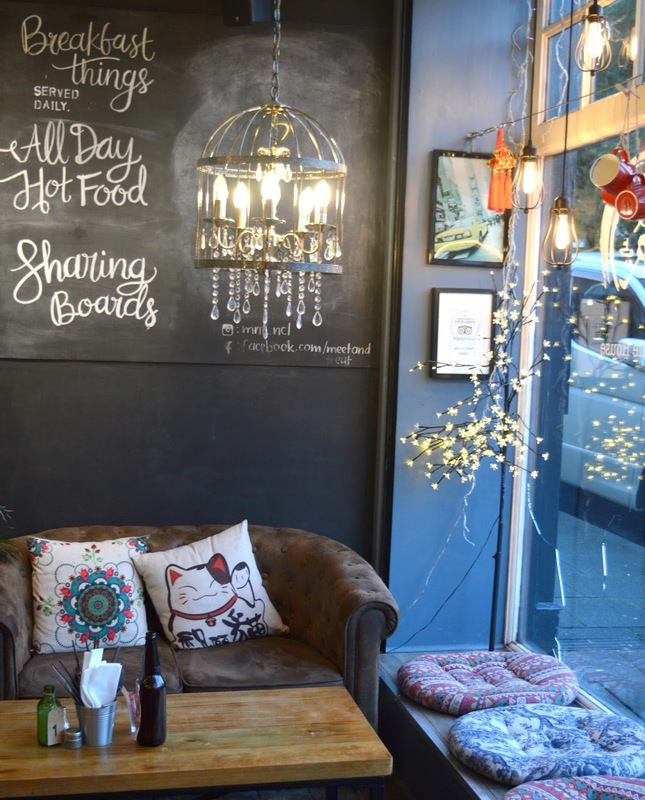 Comfy sofas, wall paintings, quirky cushions, hanging tea cups and exposed lights make Meet and Treat the kind of place that you'll want to explore before you've even opened the menu. It's perfect for the upcoming colder seasons. Winter is coming, and Meet and Treat is the ideal hideaway from the rain and will definitely be my little haven when the evenings get dark. Oh, did I mention "that floor"? 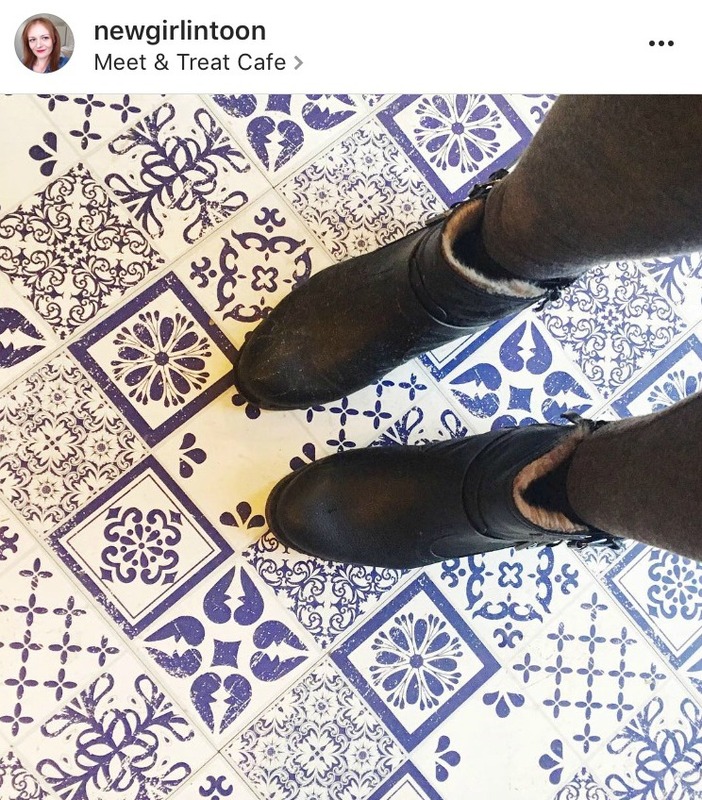 If you're a regular on Instagram then you will have seen plenty of feet appearing on Meet and Treat's picture perfect tiled floor! It's proved so popular it even has its own hashtag. I couldn't wait to get my feet ready for my #meetandtreatfeet moment and was slightly gutted when I somehow managed to get my boots covered in muddy water just before I arrived at the cafe. Make sure you check out the hashtag on Instagram for plenty of fancy feet that aren't covered in mud! My long overdue visit to Meet and Treat was for a much needed girls night with my besties, made even better by the cafe celebrating hitting over 2,000 likes on Facebook (amazing!) and offering BYOB with no corkage charge for the whole of September. We brought along a bottle of wine and some, oh so classy, tins of G&Ts to fill up our ice bucket which got our evening off to a great start. The menu at Meet and Treat is amazing! One of the very best in Newcastle and an absolute nightmare for the indecisive foodie. I wanted one of everything, in fact I know that I'm going to have to make many many more visits to work my way through all the dishes I want to try. 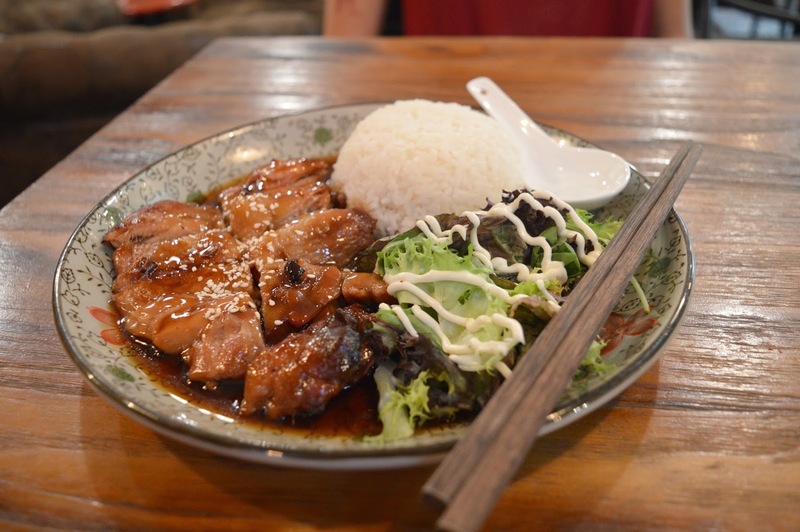 Small Bites (perfect for over ordering and sharing), Soup Noodles, Gua Bao and Rice Dishes - the list of food seemed endless and as I glanced down the list my tummy was growling. I need to reach a decision fast! We each decided to pick something off the Small Bites to start with and I went for the Deep Fried Vegetable Dumplings £4.90. They were little pieces of heaven, so delicious I could have devoured plate after plate of them! For the main event I decided to go for the Teriyaki Chicken with Rice (£9.50). Perfect for my sweet tooth, it was really sticky with a beautiful sugary kick. The meat was cooked to perfection and the rice was the perfect accompaniment. One dish down, a whole menu left to try! Guys, I think I can feel an obsession coming on! Meet and Treat exceeded my expectations, lived up to the hype and I'm now on a mission to try as much of the menu as I can. I'm already making a plan to visit with Simon as I've heard a lot of whispers that the desserts are fantastic and the waffles and milkshakes have to be tried. I think we know that has our name all over it. For more food adventures in Newcastle and across the North East be sure to follow New Girl in Toon on Facebook and Instagram. I loved our little mate date! 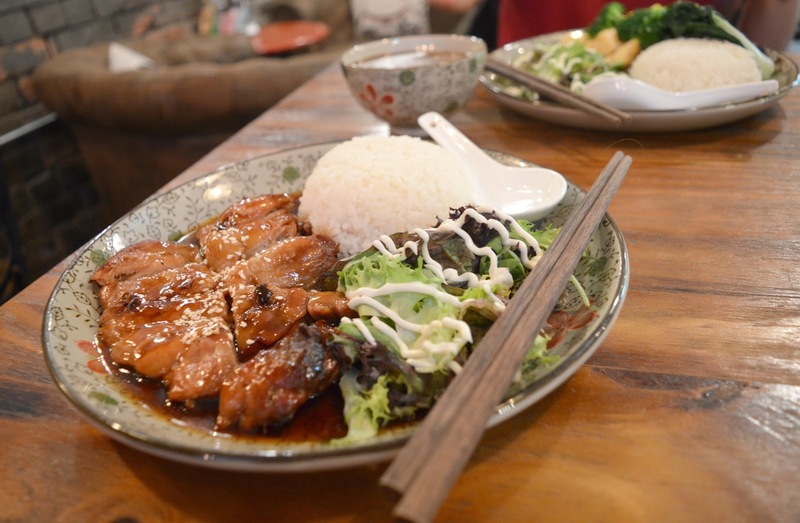 That Teriyaki Chicken is SO good! Love this little cafe, you definitely need to try the waffles! !